A select number of Year 11 students attended an ethics seminar held in Bloomsbury Church on the 6th of November 2015, hosted by Dr Peter Vardy. The morning’s discussions focused on the essence of ethics and its connection to our lives. Dr Vardy argued that Religious Studies is the most important subject in the modern curriculum because it plays such a central role in government decision making. Fulham Cross students were joined by an additional 525 students from various other schools and participated in an interactive debate on whether or not humans have a moral obligation to breed for genetic excellence. 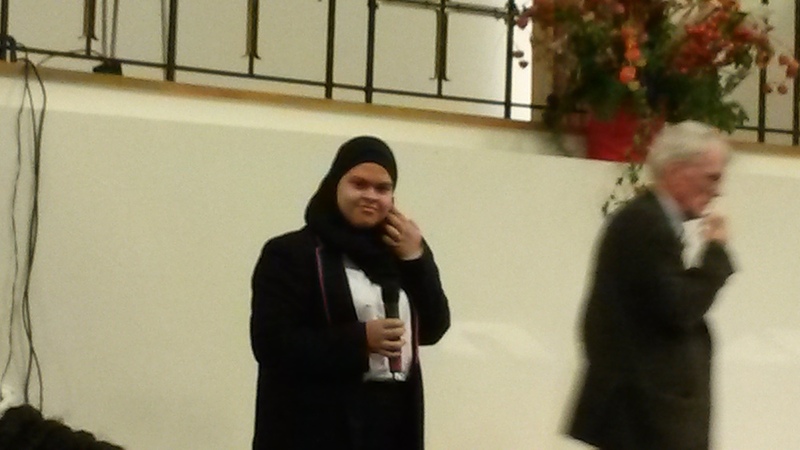 Amatullah Abouchouche of 11U joined those brave enough to stand in front of the audience and argue her viewpoint. The afternoon included an analysis of different perceptions on justice, punishment and war from both within religious tradition and outside. Dr Vardy presented the girls with video footage and comparative charts on how the world today views justice based on society's values rather than human rights. Finally, the day ended with a discussion on marital relationships and their role in modern society. While the topics interested our girls, most enjoyed the university-style in which they were addressed and how they were able to interact with other schools on the basics of religion. We were each permitted to share our perceptions no matter what they may have been, receiving first-hand experience of what it may be like when we attend university in three years’ time.